With the English countryside passing by below a Dan Air Comet 4 races past the clouds. With the English countryside passing by below a Dan Air Comet 4 races past the clouds. 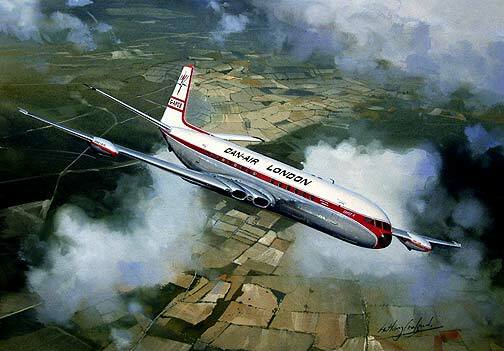 Without doubt Dan Air became the largest user of the Comet and introduced the jet age to many holidaymakers. Released as a limited edition print of just 250 by the artist Anthony Cowland G.Av.A.